Products and services touted as the latest and greatest are part of the information technology landscape, sprouting like dandelions at regular intervals. But in a short time, many of those innovations become integrated into other products and services or are replaced by something else. Rarely does one live up to its billing as a breakthrough. 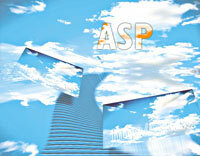 The newest kid on the IT block is the application service provider, or ASP. Hundreds of companies have sprung up, offering to marry your data with their servers and applications. ASPs promise lower costs, less downtime and access to the latest software. And even though the right ASP might be advantageous for some areas of government, agencies should do their homework thoroughly before signing on. ASPs are the latest incarnation of an old concept'having someone else host and maintain the server and application software'similar to time-sharing, service bureaus and Web PCs. Even local- or wide-area client-server arrangements are an example of this principle. Hosting has become even more common with the rise of the Internet, which is completely based on the idea of being able to access data and programs using someone else's computer. Hundreds of millions of users worldwide employ hosted applications such as search engines, e-mail programs, personal Web pages, online games, data warehousing and mining, shopping robots and personal calendars. The concept of hosting has not been limited to the commercial sector; government agencies have been giving the general public access to everything from the Occupational Safety and Health Administration's inspection files to Supreme Court decisions and even contract bidding specifications. It is now common practice to have a few inessential systems running on the Web. What is new is outsourcing mission-critical, enterprisewide systems'perhaps even an organization's entire IT department. Accessing these programs via a Web browser is also new, and software advancements have helped make that possible. But the crucial contributing factor for making this happen was the creation of an infrastructure to support this function. With the proliferation of data centers and broadband networks, routes now exist to allow worldwide transmission of data at speeds fast enough to make ASPs viable. In most cases, a telecommunications company or an Internet service provider takes care of the network and data center portions. The applications can be supplied by one of many software vendors, with the code rewritten for a Hypertext Markup Language interface or specifically written for access via the Internet. Another alternative is to take an existing Microsoft Windows or Unix application and use Metaframe software from Citrix Systems Inc. to allow it to be accessed through a browser. The ASP marketer is the client interface, responsible for contacting and selling the client on the service and arranging partnerships with providers of the other elements. A variation on the ASP marketer is the integrator, who combines the offerings of several ASPs to offer a wider choice of applications. Using an ASP has advantages and disadvantages just like anything else that is rented rather than owned. On the plus side, there is no large capital outlay on equipment or maintaintenance. The cost is a fixed monthly fee. Implementation is much quicker than it would be if you were building your own system. The latest software updates are available without the headaches of installing and debugging. And IT services can be expanded without hiring more personnel. On the downside, the user never gains equity in the equipment or software, but must keep paying for the service from there on out. Pricing structures vary: Some ASPs charge a fixed monthly fee or a per-use fee; others require the software to be purchased up front and then bill for hosting and maintenance fees. Furthermore, to be profitable, ASPs must provide services to a large number of clients, and that limits the amount of customization they offer. Industry analyst International Data Corp. of Framingham, Mass., predicts that the worldwide ASP market will grow from last year's $297 million to $7.7 billion by 2004. The companies now in the field make up a who's who of the computer industry. Though formed in May 1999, the ASP Industry Consortium's membership includes more than 400 companies, including Cisco Systems Inc. of San Jose, Calif., Computer Associates International Inc., Hewlett-Packard Co., Oracle Corp. and Sun Microsystems Inc.
Every month, more companies announce their ASP strategies or form new alliances to provide the necessary software and infrastructure. In February, for instance, Cable & Wireless USA of Vienna, Va., and Compaq Computer Corp. announced a $500 million joint venture, while SAP AG of Walldorf, Germany, added a multinational ASP partner for its Enterprise Resource Program. In March, Computer Associates announced an investment in InfoCast of Lakeland, Fla.; Integris Inc. of Pleasant Grove, Utah, partnered with Viridien Technologies Inc. of Boxborough, Mass. ; Electronic Data Systems Corp. announced four levels of ASP services; and PeopleSoft Inc. of Pleasanton, Calif., began hosting its own applications. Microsoft Corp. also has announced plans to rent its software, but whether this will occur depends on the outcome of its antitrust case. Even Big Blue is getting into the act. IBM Corp. hosts its own WebSphere applications, but the company appears to be more interested in supplying hosting services for other ASPs. It can provide services through its Schaumberg, Ill., data center and will open additional data centers in Raleigh, N.C., and Boulder, Colo. At the moment, IBM has more than 40,000 servers available for hosting and expects to have more than 100 ASPs as clients before the end of the year. Although ASPs are rapidly gaining momentum, the question of whether an agency should outsource its applications can only be answered with an absolute, unequivocal maybe.
' Do the applications operate similarly to the ones my department uses, or will the employees have to be retrained?
' Are the pipelines in place to provide as quick a response as my system users get now?
' Does the ASP offer wireless support?
' When there is a problem, what is the guaranteed service time?
' What level of customization does the package include?
' In the event of a carrier going down, what backups are in place?
' If we decide to switch to another service provider or to bring the applications back in-house, will the data be in a format we can read?
' How will the applications integrate with other nonhosted applications used in my department?
' Is the company in good enough financial condition to provide the expected level of service throughout the contract?
' What online security measures are in place? Where is the hostinglocated? What on-site security measures does the hosting facility have? Will the applications have a complete audit trail, right down to the record or field level?
' What other vendors provide the service and what performance guarantees do they offer?
' Are the hosted applications for thick or thin clients?
' Is there a locally stored version of the database that can supply reasonably current data in case there is a problem with the network carrier? Business users have so far reported mixed results. Some got up and running quickly, but others experienced delays and lost income. In some cases, the programs ran slowly or not at all. Despite such problems, an IDC survey conducted earlier this year showed that 29 percent of government IT managers want to use some ASP services. Given the amount of money being invested in ASPs, the problems encountered to date will likely be ironed out soon. But deciding to use an ASP is as much a matter of lifestyle as it is of technology or of cost comparisons. Like selecting a life partner, both parties need to make a thorough analysis to determine whether they can live happily ever after or are likely to go through a messy divorce. Managers who work with an ASP must understand that their agency's data and software will no longer be in their sole possession but will become a sort of community property. The ASP can offer upgrades to the latest software, but the ability to customize it may be limited. Will the data and applications seamlessly integrate with other programs running in-house? Is the company stable enough to provide consistent, long-term service, or will it collapse, leaving the agency high and dry? If profitability drops, will the ASP cut service personnel to increase its return on investment? If the relationship doesn't work out, can data be retrieved in a usable form? A small department with no IT staff and little or no legacy information can get its electronic-commerce effort up and running quickly with an ASP. Using an ASP can also be helpful for a short-term project in which the cost of purchasing servers and software would be prohibitive. But an established office with its own IT personnel and equipment, its own proprietary or customized programs and decades of legacy data might have little need for outsourcing. Such applications might even create integration problems that sabotage the hoped-for cost reductions. Web-hosting programs developed by Cyrix, IBM and others do, however, offer opportunities for government IT shops to expand the availability and interchange of data among their units and other agencies, vendors or the public. Census, geographic, health, engineering, purchasing and other data that call for special software can be set up as Web-hosted applications requiring the user only to have a browser. LAN applications also could be set up as intranet applications for remote users to access. The ASP field is rapidly changing, so managers need the most up-to-date information. The ASP Industry Consortium, whose site is at www.allaboutasp.org, has general information on the state of the industry and links to many of its members. In the future, the site will have a searchable database of the products offered by their members. ASPstreet.com of San Franciso, at www.aspstreet.com, has a searchable database of nearly 2,000 ASPs, and users can submit requests for proposals to members meeting the buyer's criteria. Search ASP, a search engine at www.searchASP.com, provides articles, tips and a search engine of more than 2,000 sites on the subject of ASPs. And a free weekly newsletter on the topic is also available from IDC, at www.idc.com. Drew Robb of Tujunga, Calif., writes about information technology.